In 2002, the Republic of Sudan continued to be embroiled in a civil war—Muslim north versus Christian/ animist south—that began just prior to its independence in 1956. While brief periods of peace and parliamentary rule have resulted in a revived press structure, military flare-ups and revolving dictatorships contribute to a heavily regulated and controlled press. By all accounts, this pattern of activity began during the Sudanese parliamentary period prior to the military coup in 1989 that put Islamic fundamentalist Omar Hassan Al-Bashir in power. Most private publications were closed at this time. The Al-Bashir government and its official censors, appointed in 1999, want Sudan portrayed in a positive manner both within the country and internationally. The capital city, Khartoum, is in the mountainous central region where the Blue and White Nile Rivers converge before flowing north as the Nile proper. The city is the center of most press activity. Sudan is Africa's largest country, and the topography varies widely from region to region: the north is arid desert; the south is tropical and prone to flooding; and the central region is mountainous. According to the CIA Factbook , the people of Sudan mirror its diverse landscape: blacks (52 percent), Arab (39 percent), Beja (6 percent), foreigners (2 percent), and others (1 percent). The north is comprised mostly by Arabs (70 percent Sunni Muslim) and by black Africans in the south (indigenous beliefs 25 percent and Christian beliefs 5 percent, mostly around Khartoum). The CIA's July 2001 estimate of Sudan's population is 36,080,373, with 45 percent of the population less than fourteen years of age. Arab.net claims a slightly different religious distribution within the population: 73 percent of the population Sunni Muslim, mostly in the north; 17 percent tribal religions; and the remainder Christian, primarily Catholic. The official language of Sudan is Arabic, but English, Nubian, Ta Bedawie, Nilotic, Nilo-Hamitic, and Sudanic languages are also spoken. Given a literacy rate of 46 percent, workforce distribution, and the daily life of the average Sudanese citizen, the print media's readership is composed of academics, government officials, and economically privileged individuals. Prior to Al-Bashir's coup, over 55 daily and weekly newspapers and magazines were published, many representing political parties' views. In Khartoum alone, 19 Arabic-language and three English dailies are published. All of these publications are banned by Al-Bashir's government, and over 1,000 journalists are dismissed or even arrested. The government in the 1990s licensed few publications, and official censors edited these. In 2001 a presidential directive lifted censorship on twelve of the sixteen daily newspapers, offering a glimmer of hope for those advocating the free expression and growth of print media in Sudan. The economy of Sudan is unstable and chronically victim to adverse weather, weak agricultural prices, and the on-going civil war. A 1996 estimate of the labor force of 11 million held that the majority worked in agriculture (80 percent), industry and commerce (10 percent), government (6 percent), and unemployment was at 4 percent ( CIA Factbook ). Oil production—85,000 barrels per day in 2001— has bolstered the economy since 1999. Seventy percent of the oil is exported, giving Sudan its first recorded trade surplus in 1999-2000; the remaining oil is processed for domestic consumption. Thanks in large part to oil production, the return of regular rains, and irrigation systems, the country experienced economic growth (6 percent) in 2001 ( CIA Factbook ). Article 26 guarantees "freedom of association and organization." Despite articles 25 and 26, the Sudanese government maintains tight controls on the press. The National Press Council oversees the media and determines who has overstepped the boundaries of the law and offended Islam or the government. Sudan's court system often supports the government's position and fines or imprisons journalists. Censorship, both self-and government-imposed, has been strong under President Al Bashir's leadership. There have been many documented arrests, closings, suspensions, seizures of copy, abductions, and threats, but there is little documentation of physical torture or the death of journalists. Throughout the 1990s, censorship, searches, and fines were well documented, however. Even with a 2001 Sudanese presidential directive suspending censorship for most daily papers, there is no de facto freedom of expression or organization since texts that contradict the government view are considered problematic and do not reach publication because of internal censorship at most papers. Most journalists do not want to risk losing their licenses. Newspapers taking more independent stances or even challenging the government are often met with harassment and legal action. For example, the English-language daily Khartoum Monitor gave strong voice to southern grievances in 2001 and received retribution in the way of harassment, fines, suspensions, and arrests. The paper then returned with a less critical tone. In the 1980s, 1990s, and into the early 2000s, the civil war left more than 1.5 million dead from violence and famine. Many other Sudanese citizens have been homeless or unemployed, and many have escaped the war by fleeing the nation. This internal strife has left a countryside scattered with landmines, refugees, and orphans. In 1999, Al-Bashir declared a state of emergency, invoked constitutional powers allotted in Articles 131 and 132, suspended parts of the constitution, and chose official censors to monitor the press. On November 29, 2001, a presidential directive lifted censorship on twelve of the sixteen daily newspapers. Khartoum Monitor , Alwanal-Watan , and al-Rai al-Akhjeri are still subject to censorship, however, because of controversial articles and multiple suspensions. According to the World Press Freedom Review , for example, on September 11, 2001, the National Press Publications Council ordered a three-day ban on the Khartoum Monitor because of articles published in August and September "which were judged 'harmful' to relations between the country's north and south." Hassan al-Turabi, leader of the Popular National Congress (PNC), has become a vocal advocate of press freedom. The Bashir-Turabi struggle and the lifting of prepublication censorship in late 2001 are hopeful signs of a movement toward press freedom in Sudan. Foreign journalists have been the targets of criticism from both the Sudanese government and from international organizations. Foreign journalists can receive the same treatment as many of their Sudanese counterparts: harassment, fines, detention, arrest, and banishment. When critiqued by the international community, the consequences for foreign journalists can be verbal and written criticism. Both The Daily Telegram (London) and the Washington Post have been criticized for their coverage of Sudan. In June 1998, the Sudan Foundation and the British-Sudanese Public Affairs Council co-authored " The Daily Telegram and Coverage of Sudan: Islamophobia, Poor Journalism, or Bad Judgment?" and "Taking Sides in Sudan: The Daily Telegraph's Support for Continuing War and Starvation in Sudan." Both articles take exception to the newspaper's facts and judgments and offer counterarguments with evidence gathered and conclusions drawn from more reputable sources. These two groups also criticized a 2001 Washington Post article on the same grounds. Overall, media coverage of Sudan has been limited because of drought and wartime conditions, which make travel between the north and the south difficult. Ethnic and religious differences and the difficulty or absence of learning of such differences among both journalists and the Sudanese themselves are another challenge to those in the media industry. The Sudan News Agency (SUNA), the official news agency, disseminates information in Arabic, English, and French to both foreign and domestic services. The Sudanese government controls all broadcast media. The Sudan National Radio Corporation provides national and regional programs. According to the CIA Factbook , in 1998 Sudan had 12 AM, 1 FM, and 1 one shortwave station. These stations offer programming in Arabic, English, and several Sudanese languages. In 1997, 7.55 million radios were estimated to be available, which translates to 4.8 listeners per radio and twelve million listeners per station. Sudan National Broadcasting Corporation (SNBC) is the official government television broadcaster. 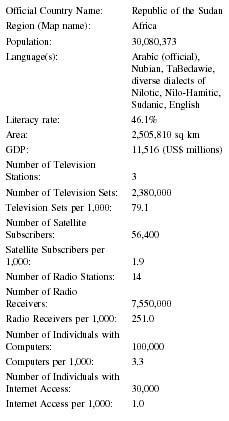 Sudan had three television stations in 1997, and the CIA Factbook stated that there are 2.38 million television sets. The television industry has a low saturation rate across the country and is more commonly viewed in urban areas than in rural areas. The Internet has extensive resources on Sudan including domestic newspapers on-line, governmental Web sites, and private and public organizations designed to educate and inform the public. One such organization—The Sudan Foundation, based in England—seeks to inform readers, connect relocated Sudanese, and battle erroneous images of Sudan. There is great concern about the Internet in Sudan; hard-line Muslims want a full ban on Internet access because they fear it fills young Sudanese with Western images and ideology. 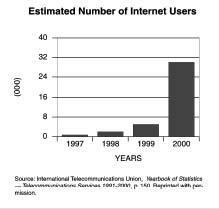 Sudan had one Internet Service Provider (ISP) and approximately 10,000 Internet users in 2002 ( CIA Fact-book ). Sudan's institutions of higher education in 2002 include Ahfad University for Women, Bayan Science and Technology College, Canadian University of Sudan, College of Technological Sciences (CTS), ComputerMan College, Neelain University, Sudan University of Science and Technology, and University of Khartoum, which has four campuses, including Central, Shambat, Education, and Medical. These schools have no identified journalism programs; presumably journalists are trained outside of Sudan, likely in England, or learn the trade through apprenticeship. In 2000, the state press council offered Internet training to journalists. International Journalists' Network offers training in Sudan and sponsors an exchange between Sudanese and Ugandan journalists that began March 28, 2002. There are several issues to consider when examining the future of the press in Sudan. First, according to 2002 data from the CIA, there is a program of "Arabization" in place whose aim is to limit the number of newspapers available in languages other than Arabic, thus curtailing readership throughout the country and the views of southern Sudan. If the "Arabization" is successful, then northern Sudan's views will be those prevalent in print and the south will be silenced. If the program is unsuccessful, the south may claim a moral victory and nothing more. Second, according to the Sudanese People Liberation Army (SPLA)—the largest armed opposition group which formed in 1984—the increase in oil production has escalated the civil war by both funding the Bashir government's attacks on the southern Sudan, forcing its residents off the land surrounding the oil fields in central and southern Sudan (Bergmann). Any increase in violence creates more challenges to those reporting for the media. However, it is the battle over oil revenues that many credit with creation of the third issue to consider, the peace talks. for a permanent cease-fire. After six months, the Protocol calls for ceasing all hostilities, establishing institutions and mechanisms, and establishing a constitutional framework. If peace persists as a result of the Machakos Protocol, then the press in the south will likely be less censored and have growth opportunities. Additionally the possibility of the south declaring independence raises questions about the way the press would be viewed and treated in a newly created nation. The dynamic political situation in Sudan is likely to continue and a free, or at least freer, press is a possibility. However, the daily strife of most Sudanese makes this struggle for press freedom a victory or defeat that may never have an impact on the majority. 1989: Bashir coup, interim constitution of 1985 suspended, all independent newspapers closed. 1998: New constitution implemented on June 30. 1999: President Bashir partially suspends 1998 constitution; Turabi removed as speaker of Parliament; local and foreign news media ordered not to cover political parties that have not registered with the government; official government censors chosen. 2001: Presidential directive lifts pre-publication censorship on 16 daily newspapers. 2002: Sudan government and SPLA sign Machakos Protocol on July 20. Amnesty International. "Annual Report 2000: Sudan." Available from: http://www.web.amnesty.org . ArabNet. "Sudan: Overview." Available from http://www.arab.net . Bergmann, Kristina. "Disputed Oil Production in Southern Sudan." World Press Review, July 2001. Available from http://www.worldpress.org . CIA Factbook. "Sudan." Available from http://www.cia.gov . International Journalists' Network. "Sudan." Available from www.ijnet.org . IRIN (United Nations Integrated Regional Information Network). "US, UN Hail Peace Deal." Available from http://allafrica.com . Odhiambo, Luke. "Regional Summit in Nairobi to re-launch Sudanese peace process," 31 May 2001. Available from http://www.reliefweb.int . POGAR: Programme on Governance in the Arab Region. "Sudan." Available from http://www.pogar.org . "Sudan: 2001 World Press Freedom Review." Available from www.freemedia.at . Sudan Foundation. " The Daily Telegraph and Coverage of Sudan: Islamophobia, Poor Journalism, or Bad Judgement? A statement of Concern by the Sudan Foundation and the British-Sudanese Public Affair Council, June 1998." Available from http://www.sufo.demon.co.uk/ . ——. "Taking Sides in Sudan: The Daily Telegraph's Support for Continuing War and Starvation in Sudan. A statement of Concern by the Sudan Foundation and the British-Sudanese Public Affair Council, June 1998." Available from http://www.sufo.demon.co.uk . United States Committee for Refugees. Worldwide Refugee Information. "Current Country Update: Sudan." Available from http://preview.refugees.org . Williams, Dana G. "U.S. news media limited in coverage of Sudan's civil war," 8 August 2001. Available from http://www.freedomforum.org .